Directors Bailey and Molly Donovan’s film "BACK FOR GOOD," an honest and comic quarter-life crisis story, is entered into competition at this year’s LA Femme International Film Festival, Oct. 19 - 22. The festival screenings will be held at the Regal Cinemas at LA Live in downtown Los Angeles. Co-written and directed by the brother-sister team, the film centers around Max Kelly, a self-described pathetic cliché. She moved to New York to be an actress, but five years later, she’s a single cocktail waitress whose agent just hanged herself. When her hometown ex contacts her unexpectedly, Max knows it’s the sign she’s been waiting for; and starts to wonder why she left home in the first place. She throws her stuff on the curb and travels back home to reclaim the love she left behind, even though he's recently engaged. Molly Donovan studied Shakespeare at London’s Royal Academy of Dramatic Art and acting at New York’s American Academy of Dramatic Arts, graduating with the honor of the Charles Jehlinger “Most Likely to Succeed” Award. Her performance as Max Kelly in the film earned her the award for “Best Actress" at the Chain NYC Film Festival, and her directorial work has been in competition at the Woodstock Film Festival and the Maryland Film Festival. Bailey Donovan is an award-winning filmmaker and co-founder of DragonWake Films. As a director, his work has been screened at the Director’s Guild of America, the Academy of Motion Picture Arts and Sciences, and Lionsgate Studios. He also served as Co-Producer on the Official Sundance Selection “The Immaculate Reception,” "Back for Good" is Bailey and Molly’s feature directorial debut. 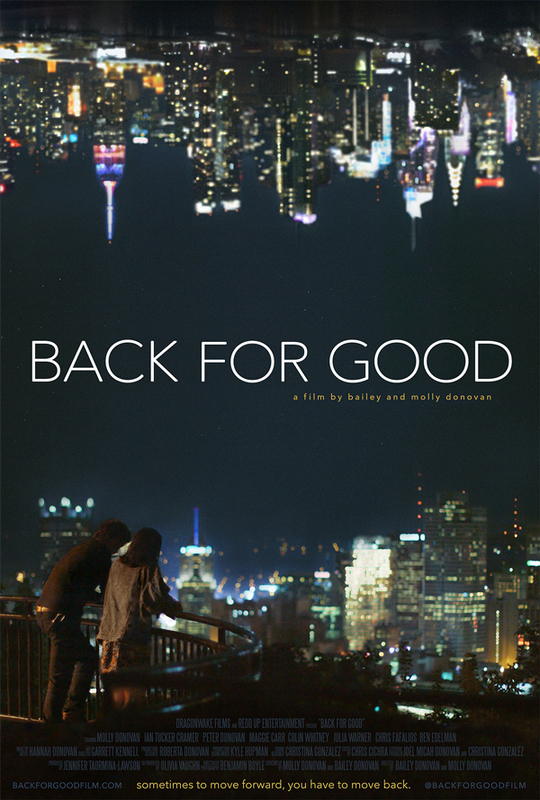 BACK FOR GOOD, filmed on location in Pittsburgh and New York, took home the award for “Best Feature” and “Best Drama Feature” from the Chain NYC Film Festival and the Atlanta Underground Film Festival, and the duo picked up awards for “Best Directors” at both festivals as well. The film will be shown at LAIFF on Oct. 20 at noon, at Regal Cinemas at LA Live, 1000 West Olympic Blvd. in Los Angeles.